Somewhere nestled in the heart of Little Tokyo sits one of the best restaurants of Los Angeles. 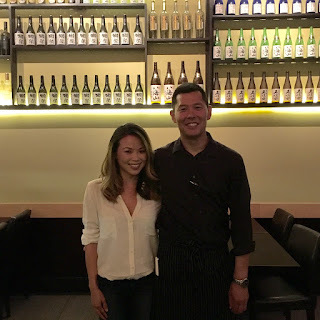 Kinjiro, operated and run by Jun, is a hidden gem offering traditional and contemporary Izakaya Japanese cuisine as well as premium Japanese sake. Izakaya, which refers to a type of casual Japanese gastropub, usually serves small plates and dishes which are meant to be shared. The restaurant looks simple, with clean lines and comfortable seats. It's intimate, with approximately 25 seats. A variety of sake line one of the walls of the restaurant where you just can't help but stare and try a sip or two. A window that sees through the kitchen allows you to watch what kind of food is being conjured up at this restaurant. It's precise and magnificent without pretentious food being served to you. Outside Kinjiro about to grub! DEWAZAKURA OKA "CHERRY BOUQUET" GINJO (YAMAGATA) COLD SAKE BY THE BOTTLE ($55.00): The sake was cold and smooth. It wasn't overly strong and had a very slight sweet finish to the end. For sake that's filtered (unfiltered is my preference), it was pretty good. I wouldn't mind ordering this again. KING SALMON SASHIMI (5 PIECES FROM NEW ZEALAND) ($15.00): This was bomb dot com. I seriously loved every bite of this beautiful fish. It was super fresh and melted in your mouth upon each bite. It was the perfect way to start a meal. A definite must order and one of my favorite dishes of the night. KINJIRO AGEDASHI HOMEMADE TOFU, ORGANIC MUSHROOM ANKAKE SAUCE ($14.00): The homemade tofu was delicious. Soft, silky and definitely well made. The sauce was rich and thick, almost gravy like. It reminded me of a mapo tofu but without the spice. I actually would have preferred a broth instead of a gravy. NIMAN RANCH PORK BELLY KAKUNI, HALF-BOILED FREE-RANGE EGG AND DAIKON ($15.00): OMG! This dish is freakin amaze-balls! The egg is perfectly soft boiled, with the rich yolk oozing out upon each bite. The daikon was delicious, soaked in a delicious broth, but I could care less for it. The star of the show was the pork belly: so moist, rich, and delicate. It's probably one of the best pork belly dishes I've ever had. The best part about it is that you don't feel sick after eating such delicious fat. CHILEAN SEA BASS "YUAN-YAKI" (SOY AND YUZU MARINADE) ($30.00): This is probably my least favorite dish. Don't get me wrong; it's still good. But, if I had to compare all the dishes amongst this one, I would have to say it wasn't my favorite. The fish was cooked well with a flaky texture and a slight sweet taste. It was good. MY FAVORITE DISH. JAPANESE A5+ WAGYU STEAK (MIYAZAKI/SIRLOIN) (6.5 OZ- $130.00): I seriously have died and gone to heaven. It was a meat fest and I wanted it all to myself cause I'm a piggy. The wagyu was perfectly seared to a medium rare. It came with a ponzu sauce and salt to enhance the flavor as well as wasabi. The wagyu with just a sprinkle of salt was simply marvelous. The steak was so succulent, tender, and rich,. I loved every bite. All the condiments meshed well with the wagyu. For a hefty $130 (since it is flown in from Japan), it was worth it. UNI UDON WITH HIJIKI SEAWEED ($20.00): The udon was perfectly cooked, with a nice, chewy texture. The uni and the seaweed were definitely prominent in terms of flavor. It's a dish not for everyone, but if you like uni, you'll like this dish. I thought it was good, but not amazing. HOJICHA (ROASTED GREEN TEA) PANNA COTTA ($6.00): This dessert is amazing. Who would've thought to make roasted green tea into a panna cotta?! Well, Kinjiro did and it worked well! The panna cotta was deliciously smooth like butter. It came with a syrup that's almost maple like that enhanced the flavor of the panna cotta. I literally just poured that syrup all over and it was magical. A must order! 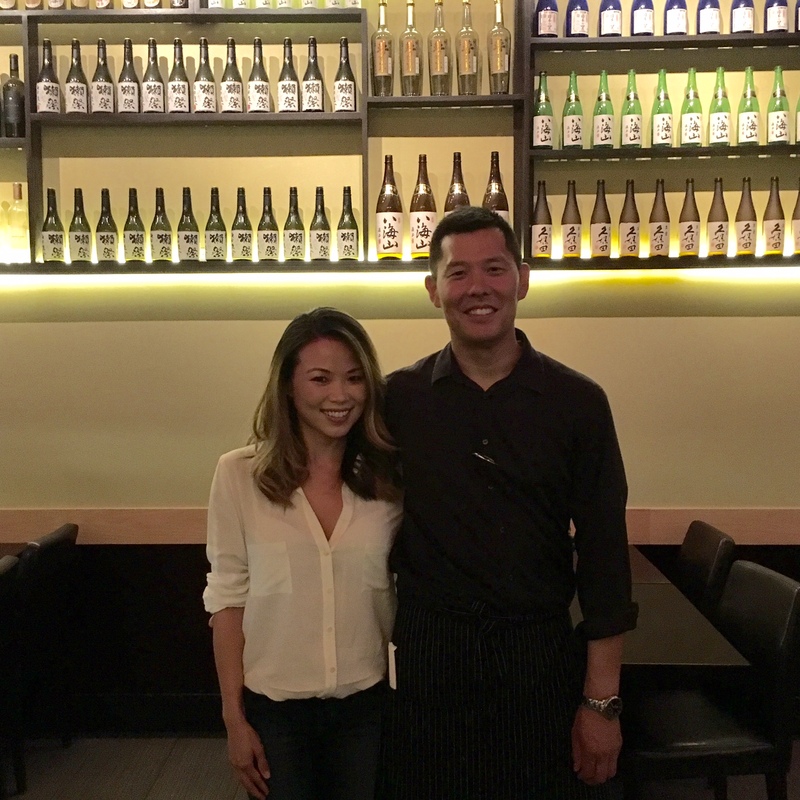 Overall, Kinjiro is one of the best kept secrets of Los Angeles. The food was divine, bursting with flavor and well-constructed. I appreciated that the waitress warned us that we ordered a lot of rich dishes and that we should order other dishes on the lighter end (hence, the salmon sashimi). The best part about the whole meal is the feeling of being full but not sick because the food was so fresh. The cost is around $$$ but if you do order the A5 Wagyu Steak, it will definitely set you back $$$$. Tip: there is a parking lot with a $3 fee with validation where Kinjiro is located, so parking isn't an issue.